Lise always thinks I should do those trendy things, so this time they tagged me to do a wish list meme. So here goes nothing! 1. How many dolls are on your wish list currently? Uh… Hm. My small wish list: 2 dolls. My long wish list? About 1000? Haha, no, 8 I believe. 2. How many Larger (65cm+) dolls are on your list? 3. What about 1/3 sized dolls? 6. What is your grail doll? 7. What is the most expensive doll on your wishlist? Well, a lot of the dolls on the list are LittleFees. So maybe LittleFee Chloe in tan, since tan is a bit more expensive than natural. 8. What about the most inexpensive doll? Possibly a Luts Honey Delf Lolly in real skin brown…but I’m not sure she’ll stay on the list? 9. Which doll do you most look forward to getting in the future? It’s almost a tie between a PukiFee Vanilla and a Honey Delf Lolly, but I think the Vanilla wins out, because I’m so unsure about the entire Honey Delf Lolly/LittleFee event face plate thing. 10. Lastly, can you list all the dolls on your wish list? Tag some people to keep it moving! I think that those I know have already been tagged? I’m not sure though, so feel absolutely free to consider yourself tagged if you haven’t been yet! One of my new blog reads, Inn of the Wayward Misfits, recently published a meme where you have to answer 10 question asked by the blog owner and then ask 10 questions for others to answer. Oooh. I’m intrigued! Here’s the post with Alesse’s 10 questions. 1. Do you blog and why? …well, obviously, yes! Haha. Well, I blog because I really like to ramble, and having my own blog suits me well. If people like to read my ramblings, I’m happy and excited, but even if nobody was reading, I’d still blog. I like to get my thoughts out of my head! Well, even though my real name is Maria, I’ve always gone by Lily/Lilanie online. And since it’s about dolls…well, it wasn’t that hard. It could have been a more poetic and beautiful name like many other blogs, but instead I opted for very straightforward and very me. 3. Do you design your own layouts or do you prefer premades/defaults? Why? Well, WordPress doesn’t really let you do your own layouts, unless you’d like to pay. 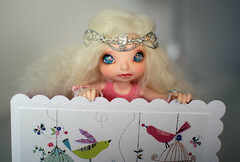 Since my blog is currently for free, because I spend all my (fiancé’s) money on dolls, I use a premade layout. I dream of getting my own layout one day…and my own .com-adress. 4. Do you advertise your blog at many places? Both yes and no. When I comment on other blogs, I comment with my WordPress-profile. On various doll forums, I either link to my blog on my profile or in my signature (or both). Plus I have traded links with a bunch of blogs! 5. Are you the type of blogger who likes to have different blogs for different subjects? Yes. I prefer that other people keep their things separate too, so it’s only natural to do the same with my own blog. If I like to read about Amy’s dolls, I don’t necessarily need to read about how Amy really likes to recreate Mona Lisa with various pasta dishes…although that would be pretty cool to read about, actually! That being said, I only have this blog at the moment. I had a nail polish blog for a very short period of time, but I didn’t feel the passion to write like I do with this blog. 6. What is more important to you; blog popularity (lots of hits/high blog view stats/number of followers), or readers who interact with you? 7. Do you ever feel disheartened by your blog and why? No, actually I don’t. I write mainly to get my thoughts out of my head, and people reading is just a huge bonus. The only thing that sometimes saddens me is when I sometime neglect my blog for a week or maybe more. I miss writing, but I can’t find the inspiration or the time. But luckily my readers are patient people! 8. Have you ever deleted a blog? Why/Why not? 9. Do you reply to comments made on your blog? Why/Why not? Yes, always! When my readers take the time to comment on my ramblings, the least I can do is reply! Other than that it helps me get new friends in the hobby, which is a huge bonus. Sometimes I also find new blogs, when their owner comments on my blog – this was the case with Inn of the Wayward Misfits! 10. How much time a week on average do you spend either blogging or reading blogs? Oh…not enough! I spend maybe an hour on each post, and I try to post 3 times a week. Reading blogs? 30 minutes to 1 hour each day. It changes with the amount of new posts from the blogs I follow. I follow a lot of nail polish blogs and a few makeup blogs, but I often just look at the pictures in those, unless something catches my interest. When it comes to doll posts though, I carefully read each post and try to comment, if I have anything clever to add! Now to add my 10 questions…you can all consider yourselves tagged! Why did you choose to blog about your chosen subject? Do you consider blogging a hobby in itself, or is it just a part of the hobby you’re blogging about? Would you like to buy your own domain? Do you spend a lot of time commenting on other people’s blogs? Why/why not? Do you mainly read blogs about the same topic as you blog about, or something entirely else? Do you have a lot of blogs or just the one? What is more important to you; blog popularity (lots of hits/high blog view stats/number of followers), or readers who interact with you? Do you post a lot of picture posts, or do you always let the text be the main attraction? Would you like to have a co-blogger for your blog?